Well, here's the last member of the Kalos legendaries that are currently available in X & Y (I'm not doing Diancie). I had a slightly harder time designing an effect for Zygarde than I did with the other two. As its name/abilities in-game go, their analogues. ATK/DEF gains/losses are reversed (which in a way counters Xerneas/Yveltal's effects). 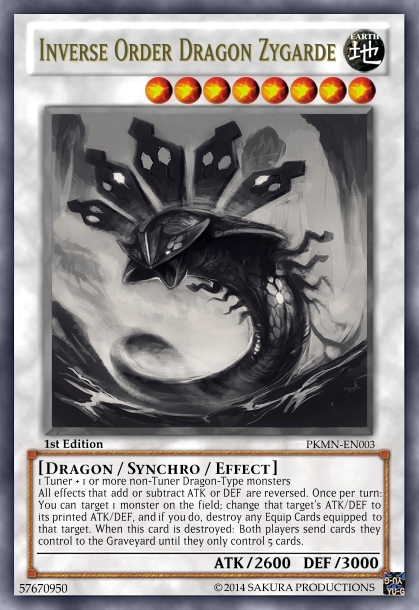 It also returns to "order" by reverting monsters that have altered stats to their printed ones. First two effects are similar to Reverse Trap (any of you remember it?) and Cleansing Water (GX manga). Reps will be given to members who give good CnC. This may be the Pop Culture section, but please try to abide by the Advanced Clause while commenting on this card. Just by looking at this card I can notice your senior experience. Talking about the card, I'm impressed reading such damn good-written OCG, especially since that's a rare thing in many threads around here. The effects don't look overpowered, but the last one could have been specified better: do you have to send cards from your deck until you have 5 left? Or do you have to destroy stuff on the field until you have only 5 (thing that can make no sense if you have less than 5 cards on field, but still) so please specify it better. The card itself has appropriate stats for a Level 8 monster, serving as a good wall. Altough I haven't seen many opponents using Equip Spells, this Zygarde rends useless every one-turn boosting Spells the opponent may play (it does with yours too, but since you're playing it you sure have a way to coop with this). The card's last effect, as I said, is not explained very well, but if I got that well it can turn the tides of a battle pretty roughly, still being more like a double-edged sword. As last thing, the image you chose for the card is good indeed, but it doesn't seem to describe the Order Zygarde represents (especially compared with your Xerneas and Yveltal cards); it still remains an impressive work of art. 10/10: PERFECT!! YOU REALLY DID IT! The last effect deals with the field; I should clear that up in the effect. But yeah, this pretty much kills Decks that rely on Equip Cards or any boosting effects [or weakening the opponent]. 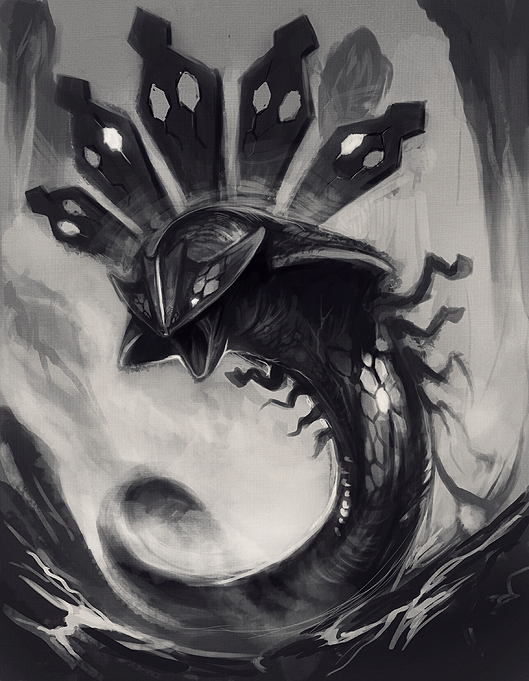 Ideally, I would've liked to use concept art like how Xerneas/Yveltal were done but since there wasn't any, had to settle for a dA user's (I generally avoid them unless I really need a good pic and Google doesn't yield me anything). Maybe the sequels will give us some usable artwork for it, but we'll have to see. As for OCG, I post in Realistic Cards as well so that's to be expected in some form (hence why I put the adherence to Advanced Clause at the bottom). I admit I'm not completely perfect on it (especially when Konami isn't exactly consistent with how they write stuff).